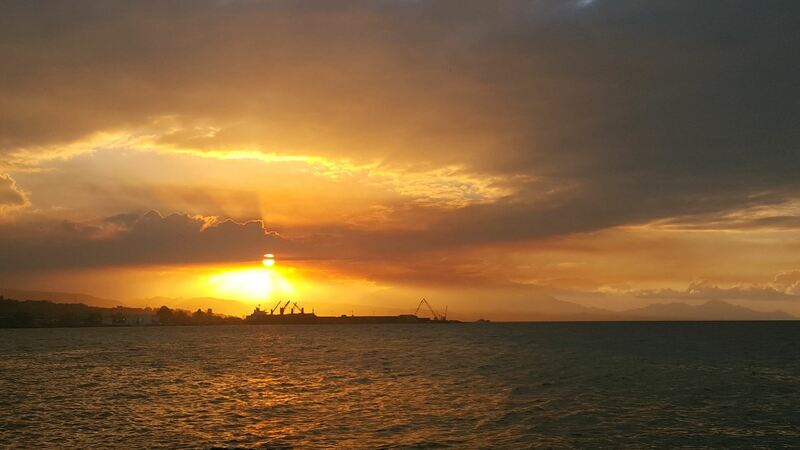 The Solomon Islands are the third-largest island country in the Pacific, after Papua New Guinea and Fiji. 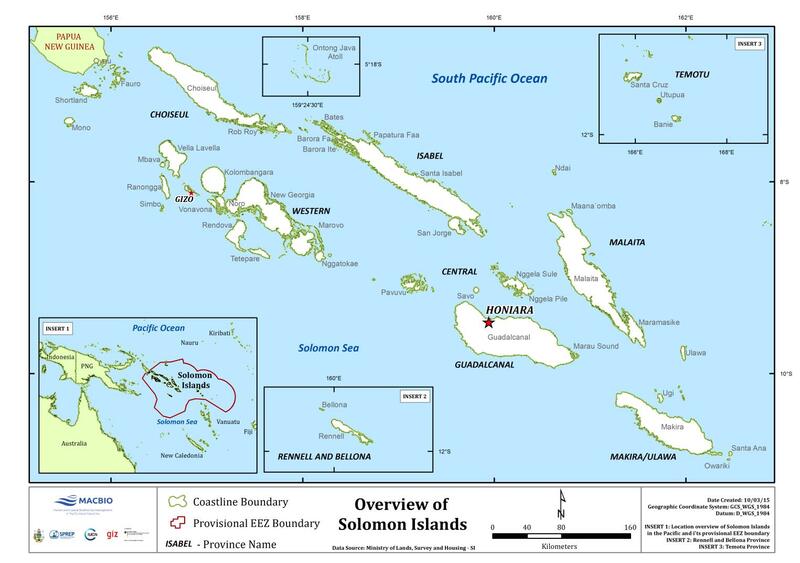 The Solomon Islands have a coastline of 9,880 km and the provisional EEZ is with 1,589,477 km2 the second largest in the Pacific. 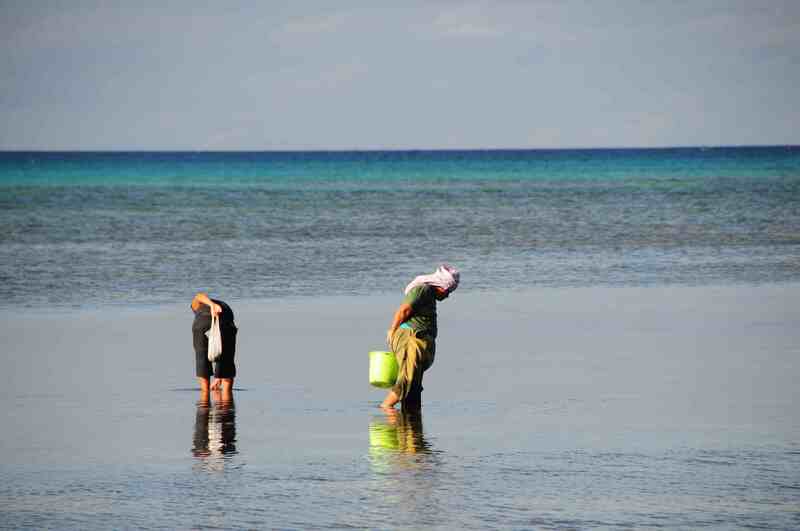 It comprises a total reef area of approximately 5,750 km2 and a total mangrove area of 642 km2. The country is composed of about 1000 islands divided into nine provinces, which differ in environment, population density and culture. In addition to this heterogeneity, there are three levels of governance over the oceans, customary, provincial and national. Approximately 80% of the land is customary land which includes foreshores, reefs and land between low- and high-water marks. This gives villagers control, ownership and rights to use of resources within the customary area. Customary rights are acknowledged by authorities and in some national and provincial laws. 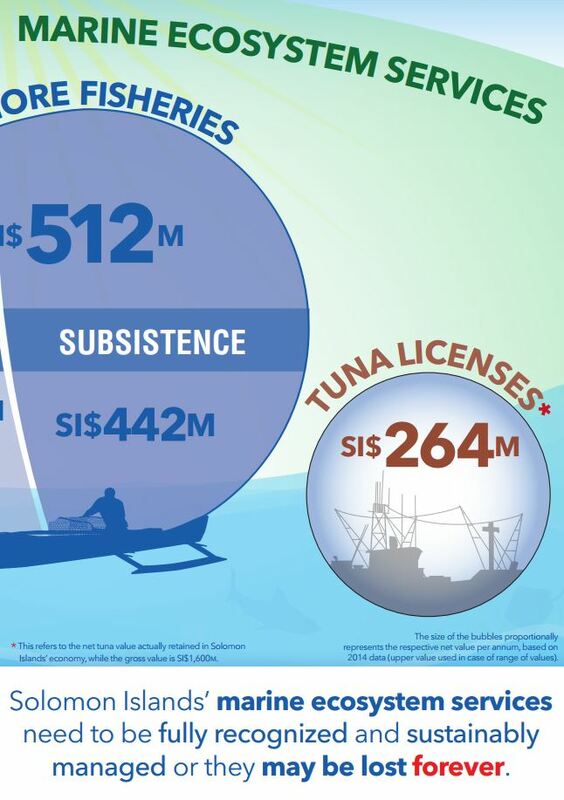 Inshore fisheries have a direct and significant benefit to the people in the coastal communities of Solomon Islands. Solomon Islands has the fastest population growth of the Pacific Island countries. 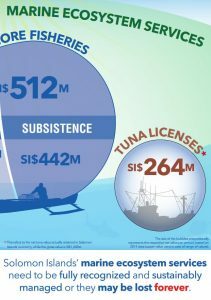 Subsistence fishing is undertaken by 60 percent of the population and contributes a large proportion of economic activity. 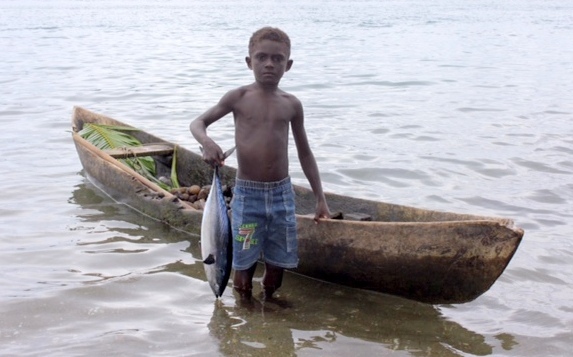 Subsistence fisheries in Solomon Islands are characterised by specialised knowledge handed down through generations. 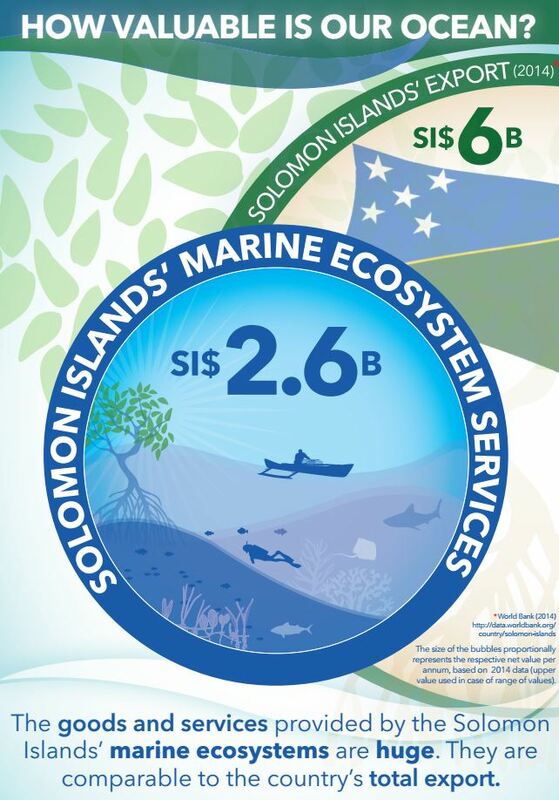 Marine and coastal ecosystems provide benefits for all people in the Solomon Islands. Yet, these ecosystem services often remain invisible. Truly recognizing the value of such resources can help to highlight their importance and prevent their unnecessary loss. The results presented here summarise a report on the economic values of the Solomon Islands’ marine ecosystem services. 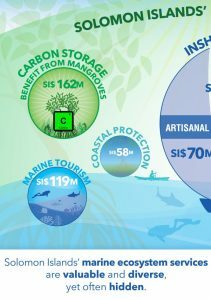 Once values are more visible, governments and stakeholders can plan and manage resources more sustainably, and maintain economic and social benefits of marine and coastal biodiversity in the long term. In 2015, the Solomon Islands Government, technically facilitated by MACBIO, hosted an in-house, cross-Ministerial Ocean Summit to explore synergies, conflicts, development and conservation opportunities in regard to marine resources in the national EEZ. At the Summit, the government decided that a more integrated, EEZ-wide spatial planning approach would benefit the future of the Solomons. In 2016 the Cabinet decided to support more integrated ocean governance and the Ocean12 meeting established an Ocean Technical Working Group and decided to develop detailed roadmaps, including for spatial ocean planning. To assist the Solomon Islands Government to achieve its targets for a marine spatial planning and effective management, MACBIO facilitated a review of legislation, policies, strategies and plans relating to the development of marine protected areas in the Solomon Islands. 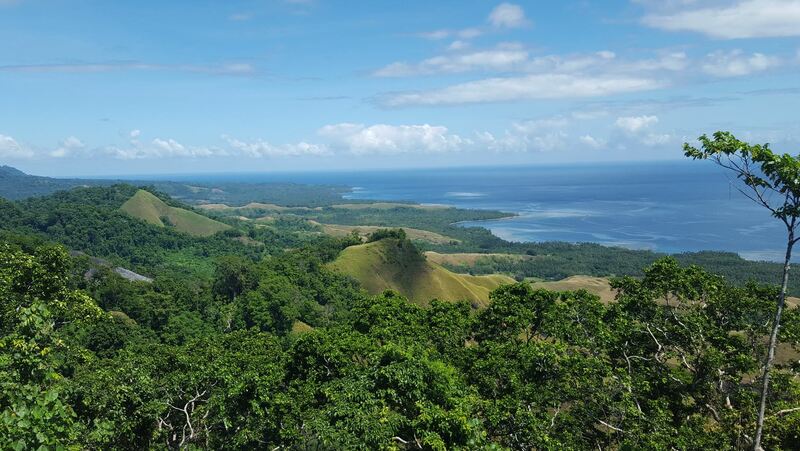 Moreover, in the Solomon Islands, MACBIO supports the examination of the successes, challenges and lessons learned from the Arnavon Islands Community Marine Conservation Area (ACMCA).